Contributors: Eun-Young Jeong in Seoul, Ryan Knutson in New York and Takashi Mochizuki in Tokyo. On the verge of challenging Apple’s mobile phone dominance, the South Korean company made a rushed decision, based on incomplete evidence, that later forced it to kill the model. The X-ray and CT scans showed a pronounced bulge. After reports of Galaxy Note 7 smartphones catching fire spread in early September, Samsung Electronics Co. executives debated how to respond. Some were skeptical the incidents amounted to much, according to people familiar with the meetings, but others thought the company needed to act decisively. A laboratory report said scans of some faulty devices showed a protrusion in Note 7 batteries supplied by Samsung SDI Co., a company affiliate, while phones with batteries from another supplier didn’t. It wasn’t a definitive answer, and there was no explanation for the bulges. But with consumers complaining and telecom operators demanding answers, newly appointed mobile chief D.J. Koh felt the company knew enough to recall 2.5 million phones. His suggestion was backed by Samsung’s third-generation heir apparent, Lee Jae-yong, who has advocated for more openness at one of the world’s most opaque conglomerates. That decision in early September—to push a sweeping recall based on what turned out to be incomplete evidence—is now coming back to haunt the company. 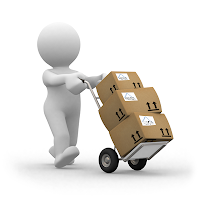 Two weeks after Samsung began handing out millions of new phones, with batteries from the other supplier, the company was forced to all but acknowledge that its initial diagnosis was incorrect, following a spate of new incidents, some involving supposedly safe replacement devices. With regulators raising fresh questions, Messrs. Lee and Koh decided to take the drastic step of killing the phone outright. The Galaxy Note series helped make Samsung a smartphone leader, and the Note 7, its most advanced phone ever, had all the makings of a hit. For a moment, it looked like the Galaxy Note could win over users of AppleInc.’s iPhone and cement Samsung as one of the world’s most dominant technology companies. Instead, as a result of the flammable phones and the botched recall Samsung’s leaders are now struggling to salvage the company’s credibility. At risk is the expected February launch of its next flagship smartphone, likely to be called the Galaxy S8. The U.S. Consumer Product Safety Commission, which oversees product recalls in Samsung’s biggest smartphone market, is expected to investigate whether Samsung notified the agency soon enough of dangers posed by the device. Samsung’s decision to launch its own recall, bypassing the CPSC’s formal process for a time, may have prevented regulators from figuring out more about the root cause, some U.S. lawmaker’s suspect. Samsung still doesn’t have a conclusive answer for what’s causing some Note 7s to catch fire. Electronics giant Samsung announced that it is discontinuing the troubled Galaxy Note 7 smartphone. The news came after it had told consumers to stop using the phone while investigators probed reports of overheating batteries. Samsung executives have delayed the development of the Galaxy S8 device by two weeks as engineers work to get to the bottom of the Note 7’s overheating problem, according to a member of the Galaxy S8 development team. 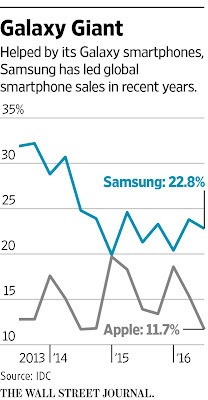 Meanwhile, investors have shaved off roughly $20 billion in Samsung’s market value. The company has said the recall would cost it $5 billion or more, including lost sales. Introduced in 2011, the Galaxy Note series has served as a point of pride for the South Korean company, which was long derided for following—and sued for allegedly copying—the iPhone. 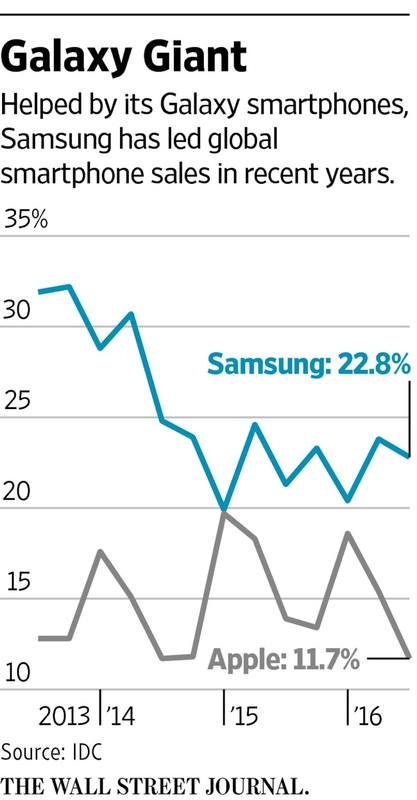 The bigger-screen phone was in tune with consumer tastes. When iPhones were shrinking in size, the Galaxy Note anticipated the shift to bigger handsets, which earned it the nickname “phablet,” a mashup of phone and tablet. By the time Samsung released its third iteration in September 2013, the Galaxy Note was a certified hit, selling 10 million units in two months. The next year, Apple released its first Galaxy Note-sized iPhone. As word reached Samsung executives that only incremental changes were likely for Apple’s iPhone 7 this year, Mr. Koh and other top executives grew confident about their prospects for a head-to-head fall release of the next version. The company decided to skip the number 6 and jump straight to 7, a name change that would invite direct comparisons with Apple’s model. Samsung’s engineers packed new features, including an iris scanner, water resistance, an improved stylus and about 16% more battery life than its previous Note device. 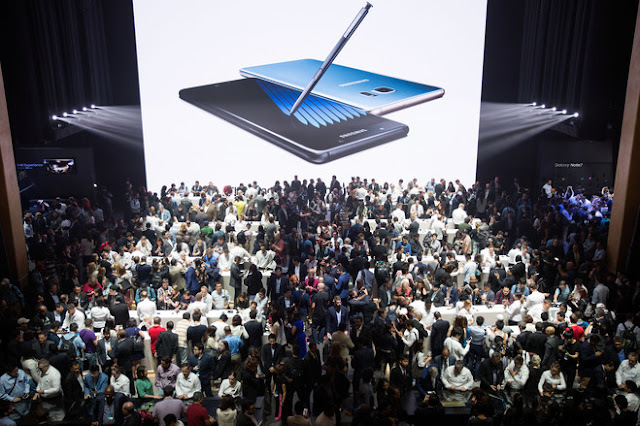 Presales for the Note 7 started strong after Mr. Koh introduced the device at a lavish event at a theater in Midtown Manhattan on Aug. 2. Analysts boosted their projections for Samsung’s earnings, while investors pushed the stock to record highs. As user reports of overheating began to trickle in days later, company executives were at first unruffled. Some suspected that many of the alleged incidents had been faked, and argued that even a small number of genuine cases shouldn’t overshadow the fact that millions of smartphones were working fine, according to people familiar with their thinking. Gathering at Mr. Koh’s office at R5, the 27-story office tower overlooking Samsung’s sprawling Digital City campus south of Seoul, he and other mobile executives, including his predecessor, J.K. Shin, and longtime Samsung top lieutenant G.S. Choi, examined the X-ray and CT scan reports of the phone, which appeared to show heat damage to the internal structure of the battery, according to people familiar with the discussions. Messrs. Lee and Koh believed they had all the evidence they needed to conclude the problem lay with Samsung SDI’s batteries, these people said. They argued it was more important for Samsung to do “the right thing” and act, in the words of one of the people familiar with the matter, rather than wait for more information. Doing so would have left customers in the dark longer and potentially allowed the crisis to get worse. On Sept. 2, Mr. Koh entered a news conference room in downtown Seoul to address reporters. Without providing names, he said the company had identified a problem with one of its suppliers and it would shift production to another supplier it believed hadn’t caused the problems. 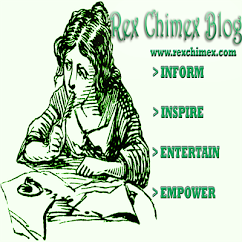 People familiar with the matter say that the supplier Samsung planned to rely on was Amperex Technology Ltd., a unit of Japanese electronic parts maker TDK Corp. In Washington, Mr. Koh’s announcement came as a surprise to the Consumer Product Safety Commission. Typically, companies work jointly with the CPSC to study a problem and plan a recall together. Samsung didn’t notify the CPSC of the problems until later that day, according to people familiar with the matter—about two weeks after the first reported Note 7 incident. CPSC regulations require companies to report potential product hazards within 24 hours, though the commission allows companies that are “truly uncertain” about an issue to spend a “reasonable time” investigating the situation. Samsung also took the little-noticed decision to pursue what’s known as fast-track resolution with the CPSC. The program allows a company to shorten the agency’s sometimes-lengthy investigation of a product problem, while avoiding a formal finding by the CPSC of a defect—a maneuver that can insulate manufacturers from product-liability litigation. At first, Samsung’s recall solution seemed to work. Consumers were turning in their phones and asking for new Note 7 phones in about 90% of the cases, Samsung said. The company’s executives basked in praise, particularly from the South Korean press that Samsung executives read obsessively, who credited Samsung with acting swiftly. A few days later, Samsung and the CPSC finally agreed to a formal joint recall. Meanwhile, complaints about overheating replacement phones, and of isolated cases of battery failures, began emerging. A Samsung spokesman said initially there was no safety concern. In China, where the company used only Amperex-supplied batteries in its Note 7s, the company dismissed reported smartphone fires as fabrications, arguing it was impossible for those batteries to have caused problems. As it became clear the reported problems were multiplying, employees describe a kind of gallows humor setting in. One mobile division executive described the Galaxy Note 7 as a “radioactive” topic, with staffers afraid of even discussing it in the company canteen. A local television news crew camped outside the offices at 6 a.m. to film a report about how many lights were on at the company, to illustrate the depth of the company’s crisis. Then came the evacuation of a Southwest Airlines Co. flight in early October because of a smoking Samsung smartphone. Top executives from major telecoms operators, including Verizon Communications Inc.’s Lowell McAdam, urged Mr. Lee to quickly kill the Galaxy Note 7 smartphone, according to people familiar with the matter. The executives told Mr. Lee the smartphone was becoming increasingly unsalable. While the decision to abort the Note 7 has halted the damage for now, analysts have raised questions about the future of the Galaxy Note series, arguing that the brand has become too tarnished by the crisis and that the company should retire it altogether. At least two U.S. senators, Bill Nelson of Florida and Richard Blumenthal of Connecticut, have asked for more details about Samsung communication with the CPSC and its handling of the phone crisis. 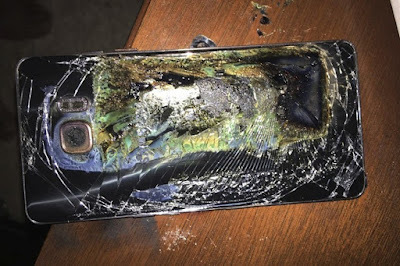 Mr. Blumenthal noted in a letter to Samsung released publicly that so far in the current fiasco, Samsung has reported 96 incidents of batteries overheating in the U.S., including 13 burns and 47 cases of property damage. Last week, at the urging of CPSC Chairman Elliot Kaye, the agency approved a proposal for a wide-ranging inquiry into lithium ion and related batteries in coming months. 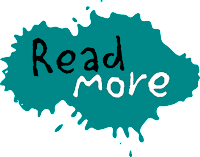 Have a look about Samsung Galaxy Note 7 Galaxy Note 7 here. Nice... When will it be out?